Starstruck, a game completely set within a miniature diorama, sees you both following music and becoming a giant hand. In a game where everything looks like clay, you can play as Dawn or Edwin, two children whose lives are tied with the fate of their town and planet. There is a lot going on in Starstruck, as it combines a few different genres to keep things interesting. Much of the game is story based, allowing you to understand how the world is being changed around you and giving meaning to what you are doing. Between bits of story and exploring the town, you also get to rock out in a band! Unlike most rhythm-based games, instead of having one line of music to follow, you’ll need to move between a top lane and bottom lane of notes, nailing them as they go by. Your friends and audience will give you appropriate comments depending on how well you do, then you can go back to exploring the town. 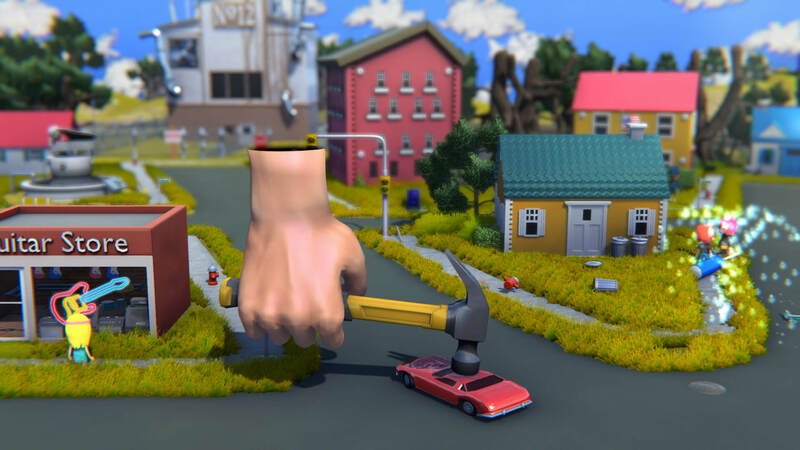 There is another mode to the game — becoming a giant hand. This may seem random, but as a giant hand, you play god. You’re suddenly able to remove obstacles from the town, destroy buildings, or just follow people around. Your actions as the hand will end up affecting the world around you. I was able to take a look at the demo of Starstruck at The Mix. The graphics of the game are charming and the guitar movement felt very natural. I didn’t get the chance to check out the hand, but would imagine that acting as a god would really add a lot to the story — hopefully even little actions of destruction change up what’s going on. Starstruck is set to release in July of 2020, but you can sign up for the game’s newsletter if you’d like!